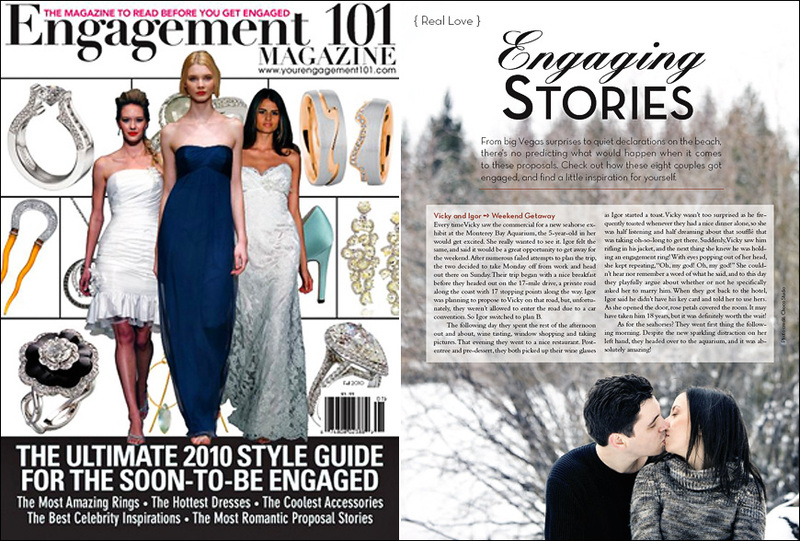 Choco Studio’s e-session in the snow is featured in “Engagement 101” magazine! The Engagement 101 magazine is a “community for the soon-to-be engaged couples” and we are thrilled to have Vicky and Igor’s engagement story and photo featured in it. This website and magazine has a wealth of advice on how to propose and choose the rings, advice on dresses, jewelry, make-up, and some real-story features. You can view Vicky and Igor’s engagement photos here and part II is here. I think this goes to show that being adventurous and trying new things always pays off! Last winter during one of our snowboarding trips we got the crazy idea of shooting an engagement session in the snow. We asked if any of our couples would be up for something different like that and immediately got a response from Vicky and Igor. Fortunately, it wasn’t too cold on the day of the shoot and we had a ton of fun walking around and even rolling in the snow :) And because the pictures came out quite unusual, the editor of this magazine absolutely loved them.